I’ve been beyond lazy about cooking dinner lately. Beyond. Which means not only is there nothing for dinner, but there are also no leftovers for lunch the next day. I’ve ordered take-out more times than I’d like to admit and have skipped bringing lunch to work, going out and grabbing something instead. All of this mainly because I’d prefer to be baking cookies. And cupcakes. And other holiday delights. And well, compared to that, dinner just sounds boring. I mean what kind of dinner has sprinkles in it? Or vanilla extract? Point made. When Campbell’s asked me to create another recipe with their dinner sauces, this time with a holiday focus, I decided to make a meal that would a) be perfect to serve a crowd for the holidays and b) produce a whole lotta’ leftovers. 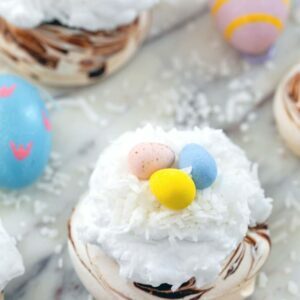 So, whether you’re planning on entertaining and need a meal to make in a snap that will still impress or just have pre-holiday cooking laziness and need an easy meal that will leave you with plenty of leftovers, I think this one will work for you. 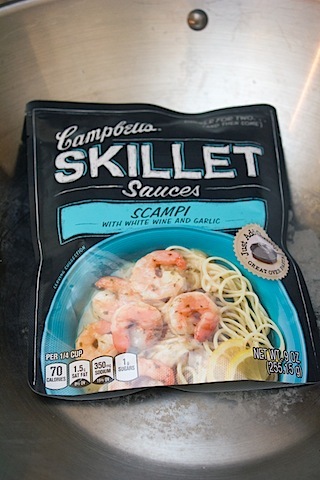 This time, I decided to try out Campbell’s Scampi Skillet Sauce. 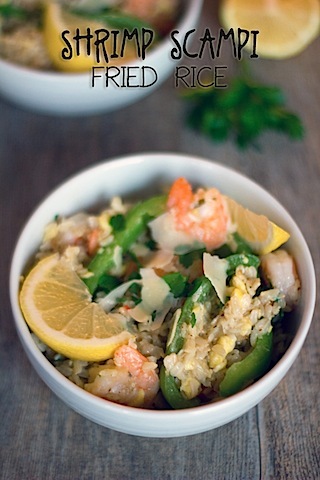 And instead of making a typical shrimp scampi, I made a Shrimp Scampi Fried Rice. Because fried rice makes me happy. Not quite as happy as sprinkles do, but still happy nonetheless. Shrimp makes me happy, too. 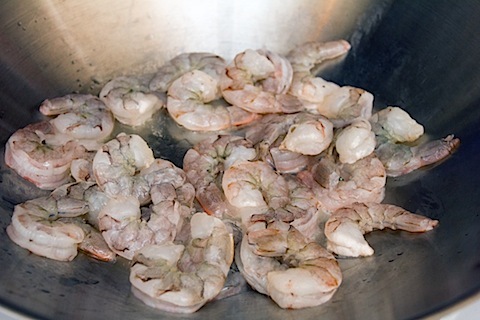 If you’re like me, you always have frozen shrimp on hand. Always. It’s the smartest thing you can do because it’s always there when you need it and easy to cook in a snap. 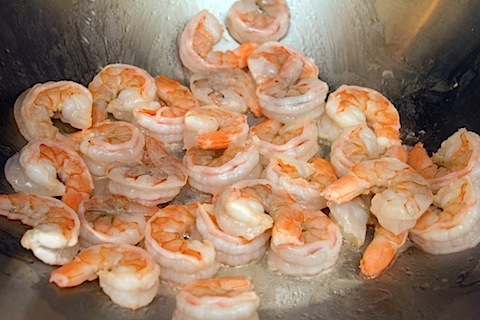 I put my peeled and deveined shrimp in a large skillet or wok over medium heat in about a tablespoon of olive oil. And cooked until just pink. Then into the wok the skillet sauce went. I brought it to a boil and then lowered to a simmer. Immediately my kitchen started smelling all garlicky-lemony awesome. 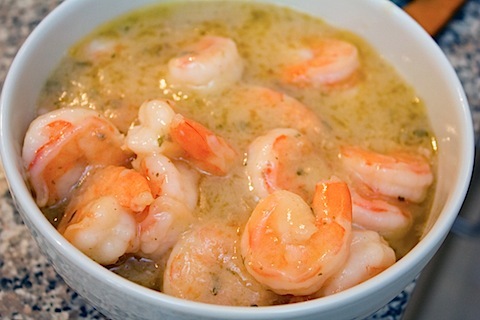 Once shrimp were completely cooked through, I moved them to a separate bowl, along with all the sauce. 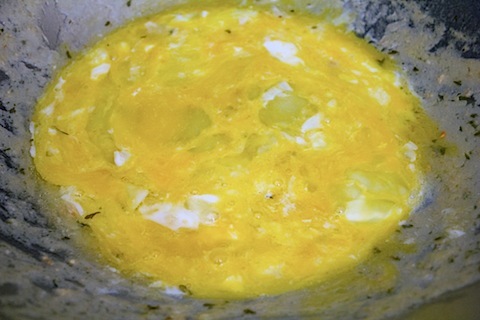 I put the wok back on the stove over medium heat and cracked my three eggs into it, scrambling them up. I put my scrambled eggs on a separate plate (you could also put them in the bowl with the shrimp to save on dish washing! ), wiped the wok out quickly with a paper towel and put it back on the stove over medium heat. 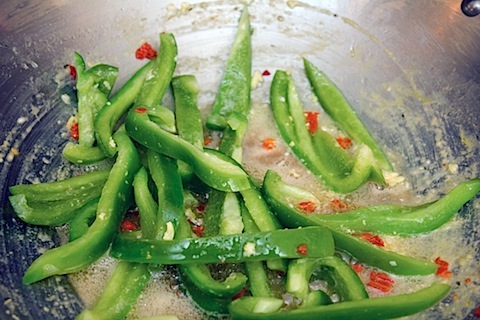 In went another tablespoon of olive oil, the thai chills, and green peppers. Then I put the rice into the wok. I stirred it a bit and then let it sit for about 1-2 minutes. Once it started sizzling, I stirred it. Then I let it sit again and stirred it when it started sizzling again. I threw in the shrimp, scampi sauce, eggs, and parsley and tossed to combine. And I served the rice in bowls with a little extra parsley sprinkled on top, along with some parmesan cheese and lemon slices. 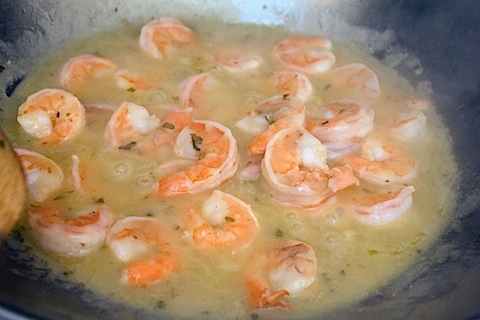 Welp, that was the easiest shrimp scampi dish I’ve ever made. And it tasted absolutely fantastic. Chris kept saying to me, “wait, you made this with Campbell’s?” Muhahaha. Not only did this dish make a delicious dinner, but now I will have lunches for the next couple crazy ridiculously busy days. I can finally stop wishing for magic elves to come into my kitchen to make my dinner and lunch. Seriously, I’ve been wishing for that. I’d still like them to make the coffee and empty the dishwasher, but at least dinner is taken care of. If I was having a crowd over for New Year’s Eve, I’d totally consider serving this (I’m going out to dinner, so will be serving absolutely nothing to anyone). But you can (and should!) make this long after the holidays are over. And yes, they are almost over. Tears everywhere. It’s always way too fast for me. One reason to actually be happy the holiday season is almost over? No more feeling horribly embarrassed for Michael Bolton in those Honda commercials. Ughhh. What’s your biggest meal challenge during the holiday season? 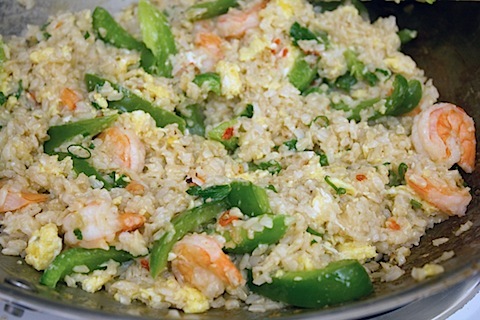 8 Responses to "Shrimp Scampi Fried Rice"
Baking really is the best! 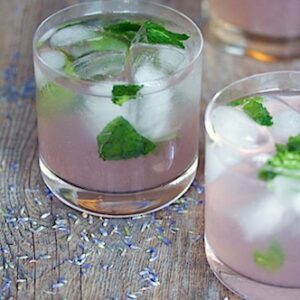 Its relaxing and delicious…I mean- what else could you ask for? 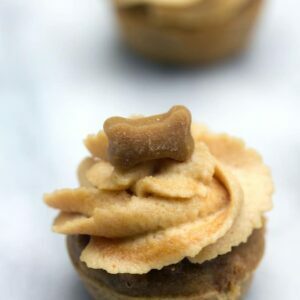 this looks totally yummy. I had some great shrimp this weekend and have been craving more ever since. My biggest meal challenge during the holidays is trying not to eat all the cookies 😉 This fried rice looks great. Merry Christmas! 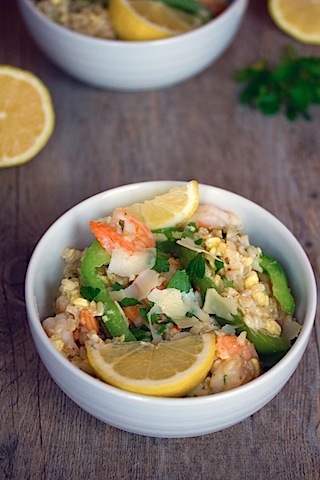 I love shrimp anything and scampi in a fried rice? Yummyy. Love serving shrimp during the holidays! So totally agree about Michael Bolton. Oh, dear. Not good. 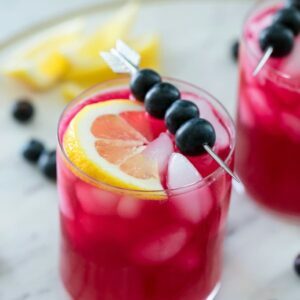 I feel like we are going to need some serious easy healthy recipes for after the holidays…and this is pretty perfect! 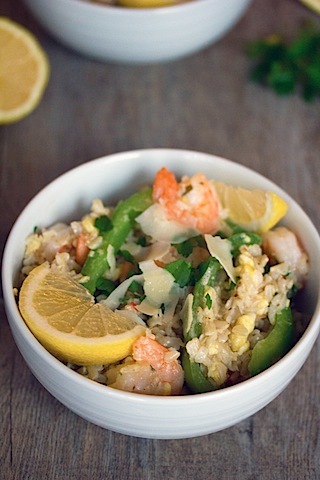 How creative to make a fried rice with the shrimp scampi. Merry Christmas and Happy New Year to all. 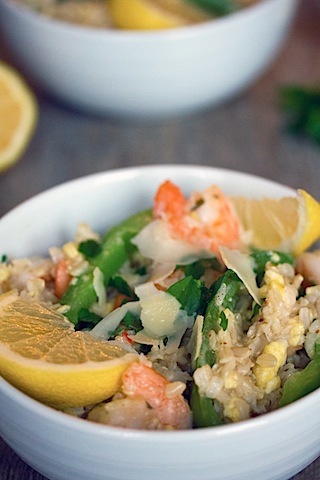 Love this creative way to make a scampi fried rice! I used the Campbells crockpot sauce and now I have to try the skillet ones too. Happy holidays!